Today's post is actually from the older children's group 6-11 yr olds but I just wanted to share a few fabulous examples of what we made. As usual this craft was only an option but it was seriously well received! Today's session was obviously, Matthew 19: 16-26 The Rich Young Ruler, or Camel through the eye of a needle or even what one of the little ones called it "The threading story"
We did spiders web prayers, taking lengths of string to symbolise something we wanted to pray for that may seem impossible! 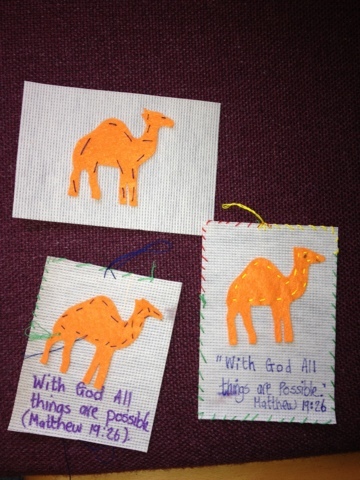 We put them in the shape of a spiders web then symbolically cut them to say God has herd. I will see if I can post the little ones activities another day - I don't have photos at the moment!